Concordia University of Edmonton (CUE) has made a deep commitment to respecting and infusing Indigenous knowledge and wisdom into the entirety of the university from curriculum to administration and policy development. CUE is striving to become the Indigenous community’s choice for post-secondary education and a welcoming and embracing campus community for Indigenous students.With this bold strategy we have retained Lewis Cardinal as our Indigenous Strategy Advisor to guide us and connect us to the Indigenous communities in Edmonton and across Alberta to ensure we do things right and with the upmost respect. 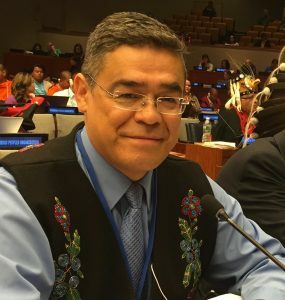 Lewis Cardinal is Woodland Cree from the Sucker Creek Cree First Nation in northern Alberta. Lewis’s office hours are on Mondays and Wednesdays from 8:30 AM to 12 Noon in G302. If you have any questions or are interested in meeting with Lewis, please email him at lewiscardinal@gmail.com, or call him at 780-288-0314.